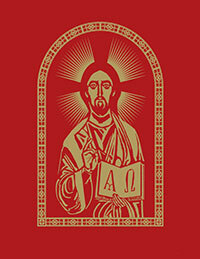 Size: 11" X 8.5" X 3.25"
The United States Conference of Catholic Bishops (USCCB) has designed a reverent book to engage the congregation to fully participate in the Mass. 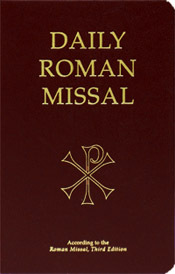 The Ritual Edition of the Roman Missal, Third Edition preserves the same expert quality, design, and affordability of previous liturgical ritual books. Produced with high quality materials, manufacturing expertise and bound for enduring continuous use, the Ritual Edition features a leather cover, gold-edged pages, strong endsheets, and lasting tabs and ribbons; bringing customers a durable and elegant volume for everyday use. The book is designed with full-color artwork drawn from details of images at the National Shrine of the Immaculate Conception in Washington, D.C. to illustrate the spirituality of the Mass.